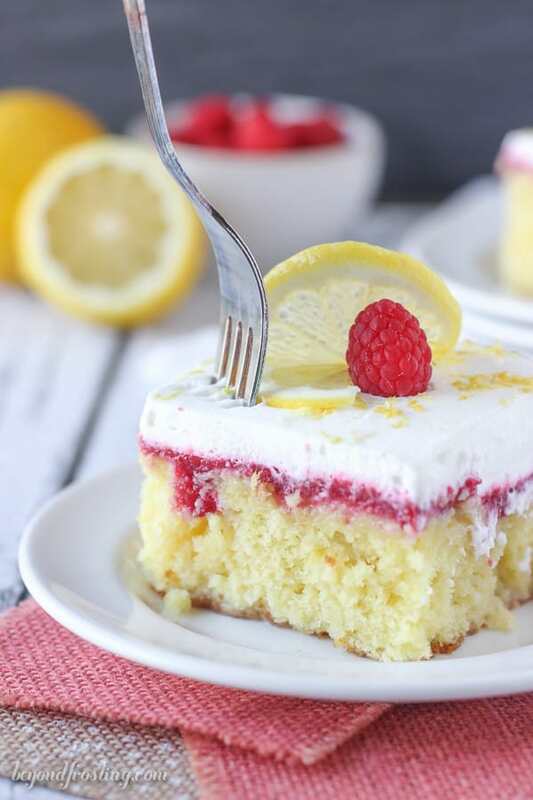 This Lemon Raspberry Poke Cake is an easy lemon cake soaked in sweetened condensed milk, with a fresh raspberry sauce and topped with whipped cream. This post has been updated in 2018 to include a video and two options for the recipe. One from scratch and one with a cake mix. After a few weeks of travel, holidays and bad eating habits, I am officially back at the gym and it hurts. The kind where you don’t want to walk up the stairs and forget putting up my hair. Does anyone really use his or her triceps anyway??? 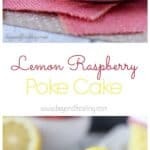 One of the reasons I am back at the gym is because this Lemon Raspberry Poke Cake happened. Of course you know that I looooooove poke cakes, and it’s only been 35 days since I shared a poke cake, so it’s about that time. I made this cake right before my dad got into town and of course I had to put aside a couple slices for him before I brought the rest into work. My dad definitely approves! It just so happens one of my coworker went back for thirds on this cake, no joke. She is pregnant, but even if she wasn’t I definitely wouldn’t blame her. There’s no stopping after just one bite. Before you know it, the whole slice is gone. 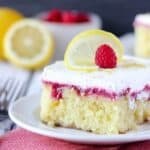 This is an easy lemon cake soaked in sweetened condensed milk, with a fresh raspberry sauce and topped with whipped cream and little more lemon zest. I mean, what’s not to love here? First, bake your cake. 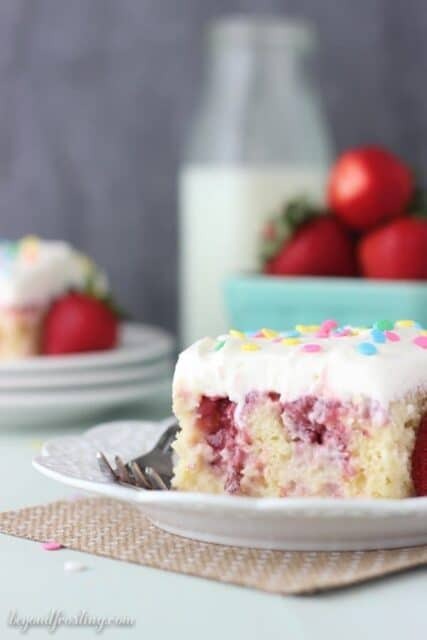 When I updated this recipe, I offered an option for both the original recipe, made with cake mix. However I also remade the recipe with a from-scratch lemon buttermilk cake. The homemade cake is a lot more dense than the cake mix version but it is pretty dang good! For the cake mix version, I use a combination of a vanilla cake mix and lemon pudding with some fresh lemon zest. You could just use a lemon cake mix, but I like the addition of the pudding mix myself. 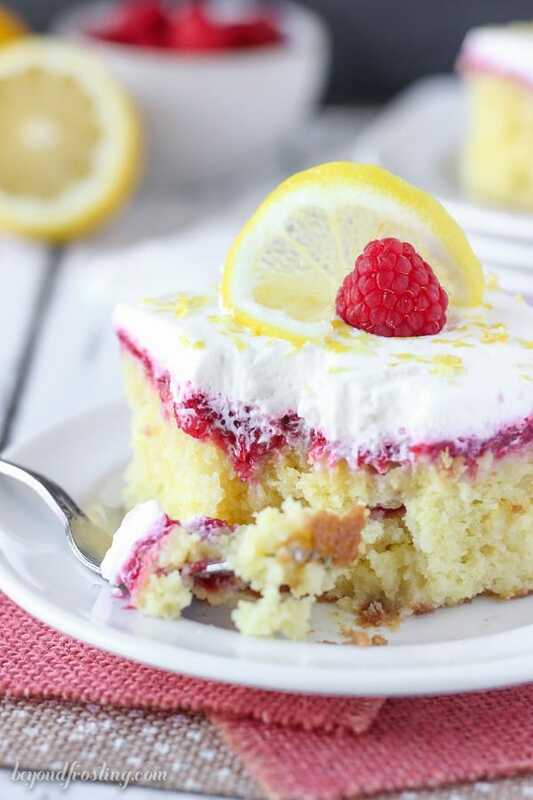 Definitely do not skip out on the lemon zest though, it elevated the punch of lemon flavor in the cake. Once it’s baked and cooled, poke the holes and pour a can of sweetened condensed milk over top and let it soak in the goodness. The homemade raspberry sauce is quite simple. I used fresh raspberries, a touch of sugar and flour and some lemon juice. This combination is heated on the stove top, until it’s bubbling and thick. I like to let the sauce cool a little bit before I put it on top of the cake, usually I just wait until it’s stops steaming and then I put the whole cake in the fridge. 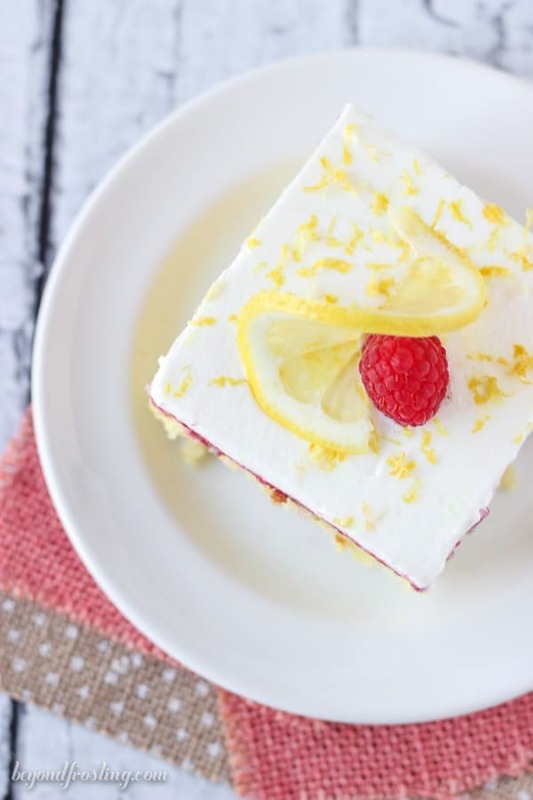 When it comes to adding the topping, you can definitely add the whipped cream ahead of time, but some of the red color from the raspberries might migrate through the whipped cream, leaving it a little red in some spots. So if you are looking for that crystal white whipped cream, you might want to hold off adding it until you are ready to serve. Then add a little bit of lemon zest to the top and call it a day. This cake is about to rule your summer. 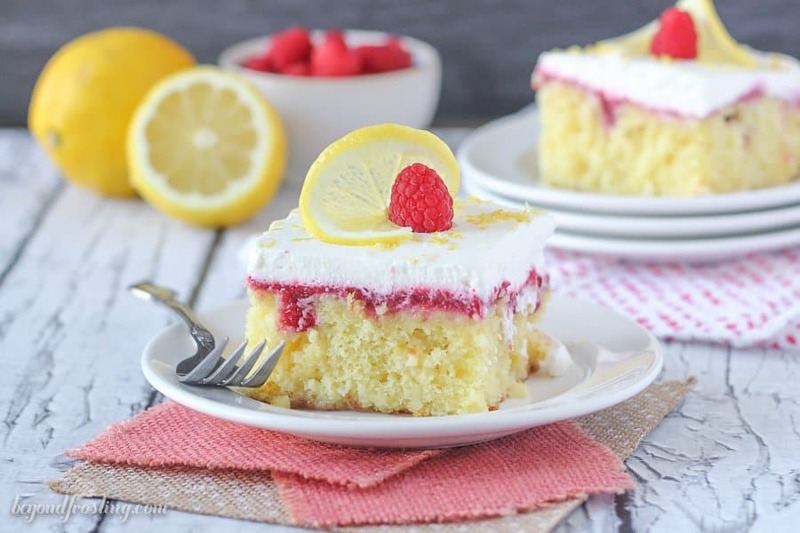 This Lemon Raspberry Poke Cake is a home lemon cake soaked in sweetened condensed milk, with a fresh raspberry sauce and topped with whipped cream. Next mix in the sour cream and lemon zest and beat until well combined. In a separate bowl, combine the remaining dry ingredients. Add half the dry ingredients to the batter and beat on low speed while pouring in half of the buttermilk and mix just until the flour starts to incorporate. Finally add the remaining dry ingredients, mixing on low speed while pouring in the remaining buttermilk and beating until all of the ingredients are well combined. Test the cake for doneness by inserting a toothpick into the center of the cake. If the toothpick comes out clean, your cake is done. Cool for 30 minutes. While the cake is still warm, take the end of a wooden spoon or another round object and poke holes all over the top of your cake. Pour the jar of sweetened condensed milk over top of the holes as equally as you can. 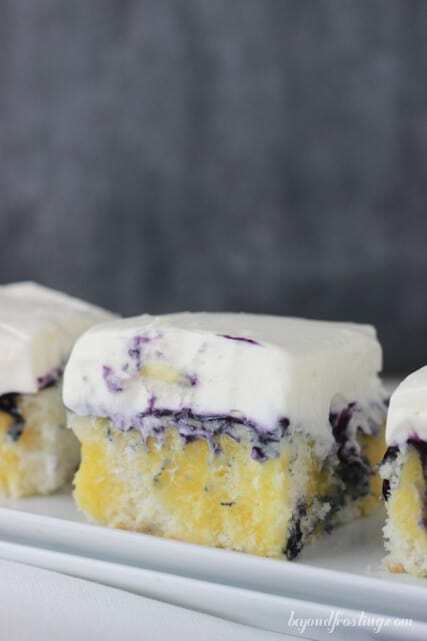 Allow the cake to cool completely, refrigerating if necessary. For the raspberry sauce: Combine the raspberries, sugar and flour in a medium-sized pot. Gently crush the raspberries and add the lemon juice. Cook over medium heat while stirring until it starts to bubble slightly. Once the sauce is bubbling and thick, remove from the stove and allow the raspberry sauce to cool until it is no longer steaming. Pour the raspberry sauce over top of the cake, spreading evenly. Refrigerate the cake until it is completely cooled. For the topping: Put your mixing bowl and wire whisk in the freezer for 10 to 15 minutes until it is completely cold. Beat the heavy cream on medium-high speed for several minutes until it starts to thicken. Add the powdered sugar and continue beating until stiff peaks form. Spread over the cake only once the cake is completely cooled. In a medium-sized bowl, combine cake mix, dry pudding mix, buttermilk, vegetable oil, eggs & egg white and lemon zest. Beat on medium – high speed until all ingredients are well blended. Use a spatula to mix the batter from the bottom of the bowl to the top. Pour the batter into a 9-inch by 13-inch pan and bake at 350°F for 20-25 minutes until cake is set. Test cake by inserting a toothpick into the center. If the toothpick comes out clean, the cake is done. Allow to cool for 20 minutes. Once the sauce is bubbling and thick, remove from the stove and allow the raspberry sauce to cool until it is no longer steam. Pour the raspberry sauce over top of the cake, spreading evenly. Refrigerate the cake until it is completely cooled. I think this is the best cake I’ve ever had. I made it for a dinner party and everyone loved it and wanted the recipe. I’m going to make it again next week for my coworkers! Woohoo!! Thank you so much Kristin!! Hello! I bake every Thursday for my co workers and this cake has been a HUGE hit! It is the prefect combination of tart, sweet..light and refreshing..it is perfect. Thanks for such a great recipe and keep ’em coming!! 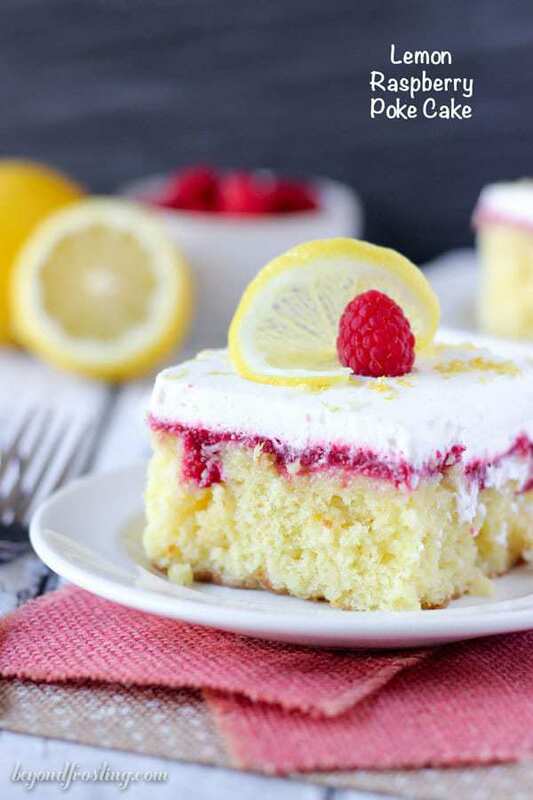 You omitted the lemon juice for the box cake version. Tiffany, could you have your pretty serving platter ready and cut pieces of this beautiful cake and arrange them attractively upon the platter. Perhaps wait until just ready to serve then sprinkle with lemon zest? Hi! If I make this the day before, should I keep it refrigerated until time to serve? Hi Jac, yes it does need to stay refrigerated. Hi Terry, it should be okay! I hope you enjoy! Hi this looks delicious and I can’t wait to try it. Can this cake be made the day before its served or does it do better making it the day of? 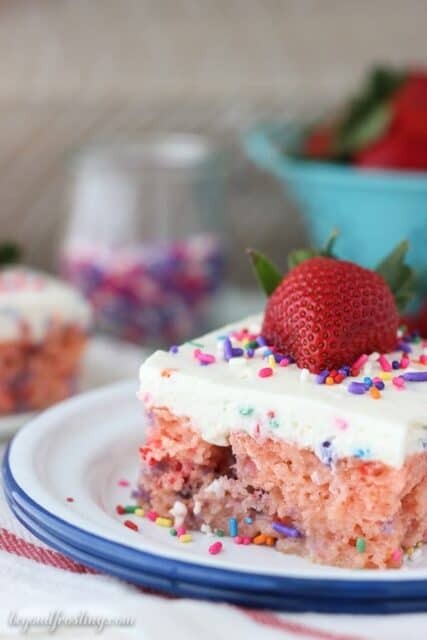 Hi Jacquelyn, you can definitely make this cake ahead of time! Hi Tiffany- yes, I don’t recommend taking it out of the dish after you add the sweetened condensed milk. Perhaps you can transfer the cake to your serving dish prior to adding the toppings? Amy! I am so glad you enjoyed this! Thank you for sharing!